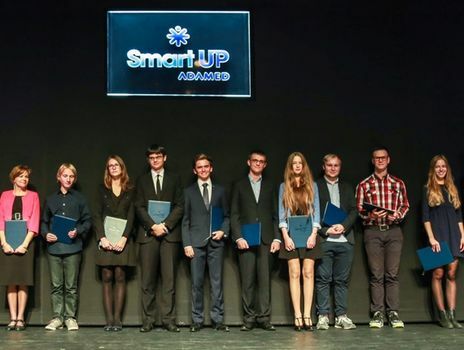 First places in competitions and Olympiads (both national and international), offers to study at prestigious universities abroad and original research projects are only some of the achievements of the grand prize laureates in the scientific and educational ADAMED SmartUP programme. Thanks to the individual educational tutoring offered as part of the grand prize, which included professional mentor support and additional academic classes, the exceptionally talented youth was given considerable help in developing their scientific careers. The results of the 1st edition of the ADAMED SmartUP programme were officially announced in October 2015. To become one of the laureates, the young science enthusiasts faced surprising puzzles and unexpected plot turns in an internet scientific game, took a knowledge test and met the Scientific Council of the Programme during the recruitment interviews. The 50 best participants of the programme went to an innovative science camp, and from among this group – based on e.g. the recruitment results, level of commitment and achievements during the course, motivation to learn and final interview – 10 grand prize laureates were selected. They obtained a possibility to benefit from the individual educational tutoring programme. Actually, it is not just another cup, diploma or financial support, but a long-term investment in the knowledge, skills and further development of your interests. The experts cooperating with the Adamed Group Foundation, who organise the tutoring, ensure that it not only meets the highest education standards, but also has a truly unique character. The content, form and manner of providing scientific assistance are tailor-made to suit the specific needs of every programme winner. Opinion about the tutoring: The tutoring broadened my horizons and gave me unique experiences. It was also a chance to improve my self-discipline and charisma, awaken my curiosity about the world and gain general knowledge. Opinion about the tutoring: Thanks to the educational tutoring I have made great progress. My passion is biology, so the majority of the classes I attend are connected with it. Thanks to biology classes conducted in English I know specialist vocabulary which will certainly be useful for me when studying abroad. They are conducted by a student of the university I would like to apply for, which makes them even more valuable for me. Opinion about the tutoring: I believe that in the long run the tutoring will act as an incentive to broaden knowledge in particular fields on my own; for example, during classes in physics and mathematics we discussed interesting issues which make me feel motivated and encouraged me to learn further. Opinion about the tutoring: In my opinion the tutoring was useful and educational. I am glad that I had the possibility to participate in the classes during which I learnt about complicated issues in a pleasant way. It is wonderful that there are people willing to satisfy my thirst for knowledge. Opinion about the tutoring: Thanks to the courtesy of the academic staff members of the site I can gain experience in laboratory work and participate in the research process. I also believe that in the long run it can be a starting point for cooperation. Thanks to this I can not only pursue my interests but also develop my scientific competencies to the extent significantly exceeding my ordinary course of studies. Opinion about the tutoring: Preparing for high school finals is an obvious benefit. Additional literature classes encouraged me to read international literature, not necessarily contemporary. Analysing physical issues on an academic level made me achieve great progress and view certain matters from a totally different perspective. Opinion about the tutoring: The classes, particularly those in physics, were very interesting and gave me a lot. They enabled me to make academic progress and to direct my scientific interests. Opinion about the tutoring: I find it very useful and beneficial. The greatest advantage is obviously increasing my knowledge and skills. Apart from that, I meet many people with similar interests who share their observations and experience. Opinion about the tutoring: Knowledge and education are fundamental values in human life. If we develop them, our future will benefit greatly. These classes helped me change my attitude towards certain aspects of school life and depart from a system which involves learning encyclopaedias by heart. Opinion about the tutoring: I am glad that I took part in the classes organised as part of the educational tutoring programme. Additional materials and the teacher’s focus on me resulted in greater learning effectiveness. I think that the classes are very useful and will bring benefits in the future. The most talented laureates will be given scholarships for further education by the Adamed Group Foundation. The registration to the 3rd edition of the ADAMED SmartUP programme is already scheduled for September. If you want to have an incredible scientific adventure and gain the chance to pursue your passions as did last year’s laureates – apply!